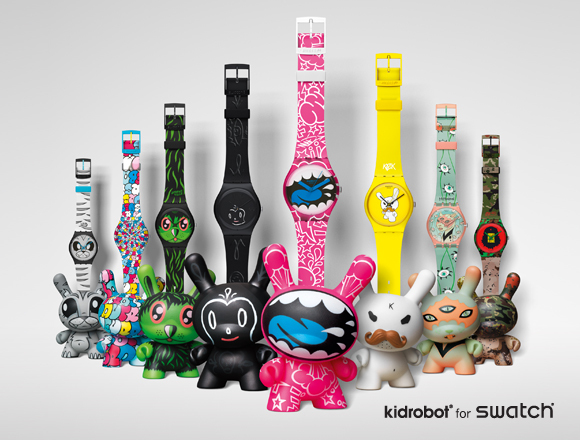 The worldwide launch of the highly anticipated Kidrobot for Swatch collaboration is rapidly approaching! To celebrate this innovative pairing of artist watches and matching Dunnys, Swatch is hosting events in 11 countries around the globe, featuring Kidrobot artists: Frank Kozik, MAD, Tara McPherson, Jeremyville and Joe Ledbetter. The festivities kick off in Shanghai August 18, and dot the planet through September 20. Spread the word around the world and prepare yourself… This is going to be HUGE!